Are you planning to start your own rental car business? If yes, then you are in the right place. People always look for quicker, safer and cheaper ways to travel from one place to another. And what could be a better option than renting a car? If you look at the big picture, a car rental business can never go out of vogue. And, if you are in the vantage point to open your car rental business that can serve a large market at less cost then go for car rental software. They are easy to use, easy to launch, decked with promising features and offers a splendid user experience. To ease out your work a little more, here we have the list of 10 best car rental software, so let’s take a look. 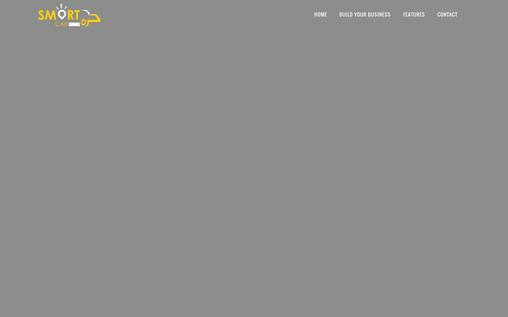 ASAP Rent created the platform that will help your company get better results, guaranteed. This ASAP Rent Software’s renowned product has won numerous awards and gained worldwide industry recognition. With over 1,000 satisfied customers, ASAP Rent is a reliable and efficient rental fleet management software. For over 20 years, ASAP Rent has listened to the industry and clients needs and met the demands of new full-featured solutions. ASAP Rent is a reliable and efficient rental fleet management software. 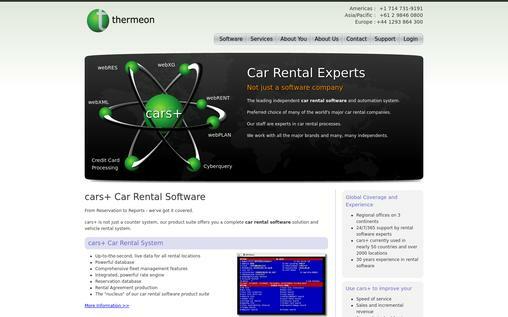 Thermeon CARS+ is an online car rental system that provides a powerful database and fleet management system for individual, franchisee and, corporate. Some of the notable features are vehicle disposal, rate engine, affordable pricing, robust and comprehensive reporting to stay on top of your fleet and more. It has simple and user-friendly design and it can be used effectively to manage fleet, reservations and more. Easy to setup in a few clicks. It includes webXG, webRENT, webRES, credit card processing and more. Highly customizable; you can set it according to your needs. Supports many currencies and languages. It has integrated accounting tools such as invoice management module, accounts receivable, document emailing feature and more. Detailed documentation helps you to understand how the software works. The customer support is available 24/7 via email or phone call. 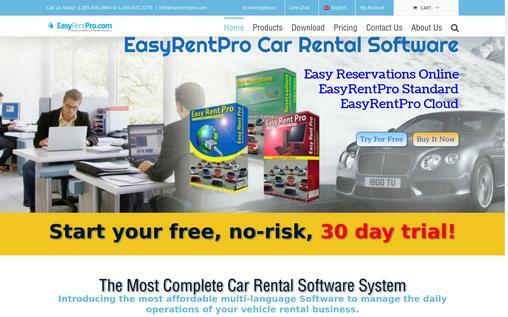 Easy Rent Pro is a car rental software to manage your car rental business. It is equally suitable for small, medium and large companies. Some of the useful features include QuickBooks integration, rate management and the ability to manage an unlimited number of cars. The software is available in three versions – EasyRentPro Standart, EasyRentPro Cloud, EasyRentPro Online. The setup is fast and easy. It offers quick lookup & Reports. This software supports multiple languages and can serve multiple locations. It can be integrated with QuickBooks to create invoices and payments automatically. You can view rental activities and vehicle reminders such as tax, insurance, and inspection dates on the planner. It can easily calculate monthly, weekly, daily, hourly time and even mileage rates. Provides detailed documentation to understand how it works. The pricing starts at $299 USD which is quite affordable for start-ups. You can take a free demo and a free trial of 30 days. Smart Car is a perfect software for car rental services designed to manage your business end-to-end. The powerful management features, clean design and the high-quality app helps you to start a taxi business for the modern audience and give them UBER like look and feel. It has integrated payment gateways such as PayPal, Stripe and, Braintree for easy payments. Comes with iOS and Android apps for each passenger and driver. Set your location zip code and the destination to find the pricing for it before you travel. The app offers hourly booking where you can find default base price per hour. Lite package of the software is available for free to use. The premium package of the software is available at a one-time fee of $1999 with free upgrades and app. It offers a free helpline for 24/7 customer support. Rental Car Manager is a web-based booking software that brings functionality, ease of use and flexibility to your car rental business. It is a complete car rental management software with amazing features to provide your business with immediate benefits and success in this competitive marketplace. Affordable and suits well for all sizes of vehicle rental businesses. The simple user interface allows you to control a host of different features such as selecting locations, managing rates, discounts, fees etc. directly from the control panel. It provides daily reporting, monthly reporting and Sales Analysis in the graphical representation. You can specify users and control the access of your users. Bookings for your vehicles can be made on Car Rental Agencies own website through API. Its system controls allow you to add and change features on the fly. Offers the feature of electronic signatures to allow your customers to sign their rental agreement before they pick up the car. 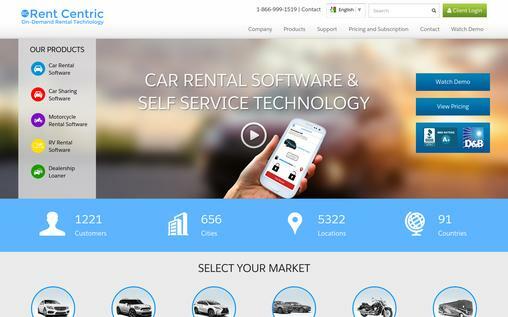 Rent Centric is an On-Demand car rental software that provides advanced tools to manage your vehicle rental operation. 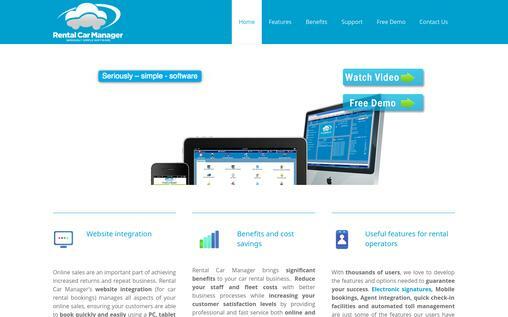 It offers a complete solution to manage your vehicles, employees, customers and revenue. This branded on-demand technology is reliable, accessible to the server instantly along with cost-conscious pricing which is suitable for start-ups to well-grown businesses. Its user-friendly system helps you to give better customer Service. The web-based reservations interface can be linked or added to your website. Apple Watch app to allow the customers to access the functionality from the mobile app. Provides you customized rental agreements and invoices that are compatible with any printer. Automated split-billing functionalities between one or multiple parties. The comprehensive reporting tool provides both summary and detailed reports. 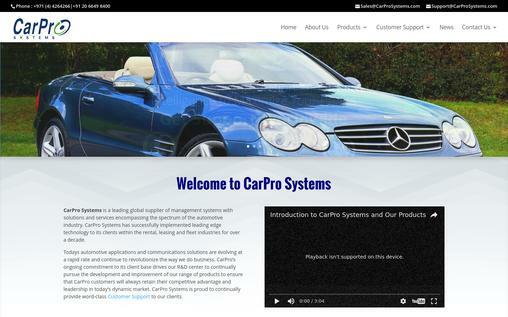 CarPro Systems provides the ideal solutions for rental, leasing and fleet industries. It is well synchronized with online booking and allows you to compete with major rental car organizations. Also, it is very cost effective, easy to use and has strong customer support. It offers various services such as RentProXL, LeaseProXL, FleetProXL, ChauffeurProXL, and GarageProXL for different industries. Integrated CRM Module offers seamless integration with your existing software to empower your employees and stay in touch with your customers. Offers advanced reporting and analyzing tools for real-time analysis that are integrated with CarPro suite if products. It offers online reservations through reservation portal. Give your customers real-time access to their own data to allow them to create reservations, print invoices, view agreements and more. 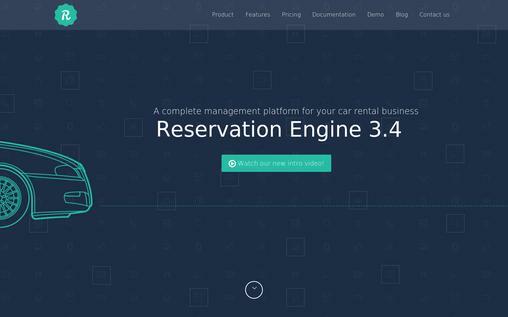 Reservation Engine is a cloud based car rental software that manages every aspect of your car rental business. With Reservation Engine you can sale from multiple points, split your workflow, save time, and track your vehicles through GPS. Some of the notable features include SMS integration, unlimited vehicles, vehicle health monitor, rental agreements, invoicing and payments, booking scheduler, reporting and much more. Auto-routing feature to save time and reduce errors. You can create separate roles and assign multiple levels of access. It offers website integration facility to use it on your existing site. You can create multiple price tables for different partners with whom you share your profit percentage. It eliminates the reservation kiosks by allowing your customers to make a reservation on their own without any middleman. The starter plan starts at €39 per month with 30 days money back guarantee. 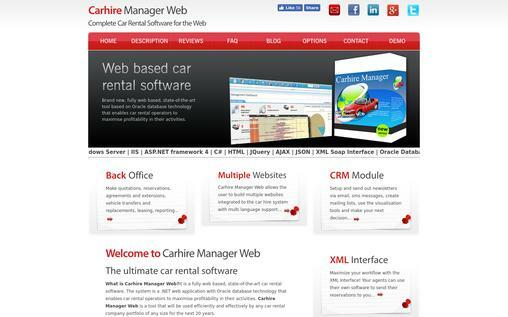 Carhire Manage Web is fully web-based car rental software that is easy to use and can be effectively used by any car rental company of any size. It is a state-of-the-art and innovative rental software that utilized the latest technology to combine all the important functionality of the car hire system together in a user-friendly interface. It offers an online vehicle tracking facility through Google maps. Provides a back-end tool (back-office) with vast features for company users. Embedded CRM module to set up newsletter, SMS, creating a mailing list, track your client’s complaints, follow up and more. It has an XML interface to receive data from agents automatically. Features a mobile device interface that can be used by the employees working outside the office and need to use its functionalities. It offers powerful reporting tools. 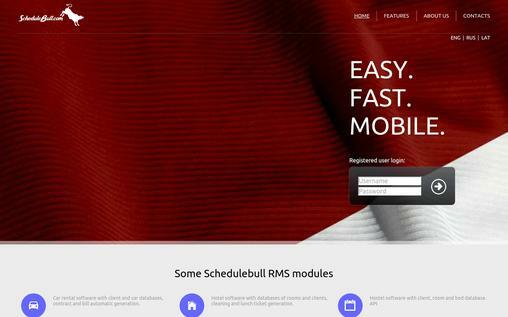 ScheduleBull is a powerful online application with responsive design that can be used on all devices including desktop PC, iPad, and smartphones. It offers all the things that are needed for everyday car rental management. It is loaded with many useful features including split billing, vehicle tracking, fleet management, fines management, rate tables and of course numerous types of reports. It allows you to create contracts, make invoices and take printouts of bills. You can create any type of reports with this software. Offers a mobile app to use it on the go. You can connect it with your software via API. It has integrated CMS to make changes in the web page easily. Offers 24/7 live support to its users. Carcloud is a cloud-based eCommerce platform that directly connects with your existing reservation system to maximize your revenue. 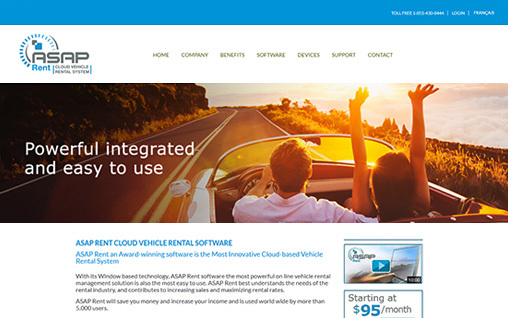 It provides a fully-featured, customizable and responsive website to car rental companies of all shapes and sizes. 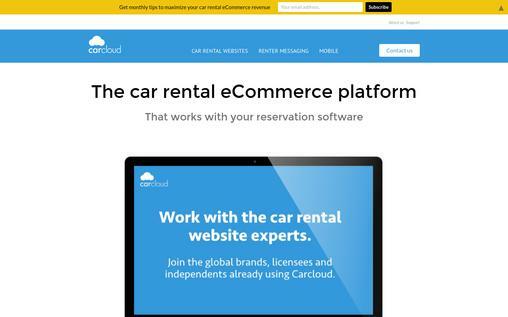 Carcloud is used by many users ranging from single site owners to global car rental brands. Built-in SEO optimization to increase your site traffic. It optimizes car rental websites to maximize the number of buyers and generate revenue. You get full control to modify car rental locations, fleet details, website content and promotions by yourself. It is fully responsive and your users can use it on any device such as mobile, tablet and desktop. Provides 24×7 support with 100% uptime guarantee. The above car rental software is designed to meet and exceed your expectations. They are readymade scripts so they are easy to launch and also do not cost you much. The final choice should be made based on the actual requirements of the business and its budget constraints. So, check out the demos or take a free trial to pick the one that offers the closest match to your requirements.